“No Enbridge! No Enbridge! 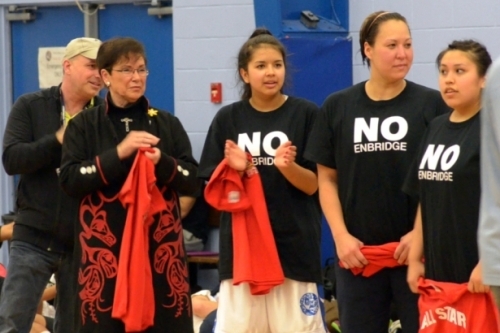 No Enbridge!” yelled the packed gymnasium crowd, nearly all wearing black protest shirts. “When you’re in politics for 36 years, I guess I kind of expected it,” Mayor Joanne Monaghan told the Vancouver Observer Wednesday. “You don’t mix church and state, and don’t mix recreation and politics,” she added. The Mayor was invited to the Haisla Village of Kitimaat, which neighbours her municipal district, to hand out a $2,000 prize for the victorious girls team – something she’s done annually for years. In the dying minutes of what was described as a “nail biter of a game” — hundreds of black “No Enbridge” t-shirts were thrown into the crowd. Before the mayor had a chance to complete her remarks, she was heckled down. “I was not shook up… I’ve always respected the Village and its people,” said Mayor Monaghan. The plebiscite, to gauge district citizen’s support for the project, is on Saturday. Haisla band members will not vote on the plebisicite, unless they are Kitimat citizens. “The excitement in the room was inspiring,” said former Haisla chief Gerald Amos. The surreal basketball game confrontation, caught on videos being circulated by opponents to the pipeline, could only be called symbolic of the growing unrest over the controversial $6.5 billion Northern Gateway project. Enbridge is campaigning for Kitimat citizens to vote yes to its project, using door-to-door visits, advertisements, and Open Houses. Unlike regular elections, there is no restriction on how much money the company can spend in this non-binding vote. Mayor Monaghan said she does not have a position, for or against the pipeline, and her municipal government has worked “really hard to stay neutral” on the upcoming vote. The 1,177 km pipeline would terminate on Haisla Nation’s coastal traditional territory, gushing half a million barrels of bitumen per day into 19 storage tanks, and onto 220 supertankers per year. The proposed petroleum facilities are not on Haisla reserve lands. Citizen group — Douglas Channel Watch — attended the game, but its spokesperson, Murray Linchin said his “vote no to the pipeline” group had nothing to do with t-shirt spectacle. “I don’t know [who did it],” added Minchi, on Tuesday. A video, shot by northern videojournalist Dan Mesec, showed a grey-haired Aboriginal man among others distributing the shirts from a box. “Deciding to hold a referendum at this late date is a slap in the face to all the work done by the Haisla Nation on this project. The Haisla Nation dedicated time and money toward testing Northern Gateway’s evidence and claims about safety and environmental protection, while the District stood by and did nothing,” wrote Chief Ross, last week. “Obviously our conversations with First Nations communities are private discussions,” he added. Giesbrecht could not confirm if Jim Prentice has visited the community. The former Harper cabinet minister has been hired by Enbridge to bridge relations with First Nations still opposed to the pipeline. The Coastal First Nations organization – an alliance of aboriginal communities on British Columbia’s North and Central Coast and Haida Gwaii — is promising legal action, as well as protests to “stop the bull dozers” if the pipeline is approved. The Harper cabinet will rule on the project before June. The Northern Gateway pipeline is one of five major pipelines that are considered critical for Alberta’s oil sands industry to expand. The tenth annual open basketball tournament is billed as a “Cultural Warming” to bridge the aboriginal and non-aboriginal communities. The Haisla girls defeated the Prince Rupert team. Posted on April 9, 2014, in Oil & Gas and tagged Enbridge, Enbridge Northern Gateway pipeline, Enbridge pipeline, Haisla, Kitimat, native protests. Bookmark the permalink. 3 Comments. Why even bother with a pipeline when solar is will be as cheap as tar sands by the time they break ground on this project.